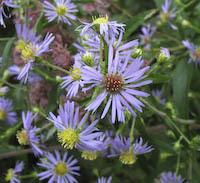 Asters are very challenging to learn to identify. The individual species are in some cases highly variable. And the features that distinguish them are often very subtle, or occur in several species. Hybrids add to the confusion! 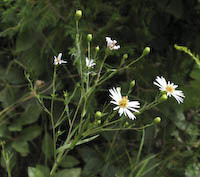 To compound all these difficulties, some Asters have conflicting common names. 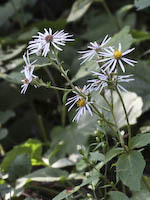 Many beginning wildflower enthusiasts, and even some experienced ones, are simply content to just call them all "Asters", without concerning themselves about which species a particular plant might be. However, they aren't really all that hard to learn. 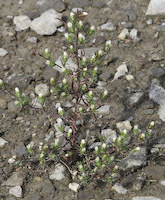 IMPORTANT NOTE: Recent genetic work done on Asters has shown that most species we have previously referred to as "Asters" are not Asters at all! They merely look like Asters! 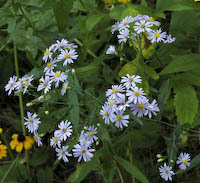 However, since they are still referred to as "Asters" in their common names, they are all still included on this website in the "Asters" group. 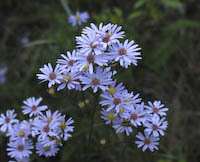 Asters have many common names. The ones listed here are the ones that I use for these species. 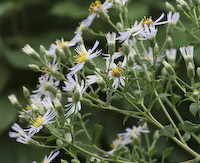 If you're learning Asters, you would be well advised to learn their Latin names as well as their common names or you risk a lot of confusion when you refer to various wildflower books. 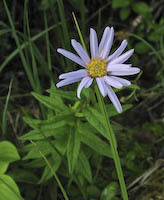 Many of the established Latin names of Aster species have been changing lately due to DNA and genetic research that is being done on all plants. I have tried in all cases to list all Latin names that have been in use for each species, but there may be some for which this website is not up to date. 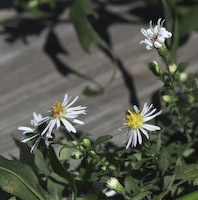 What makes an Aster an Aster? 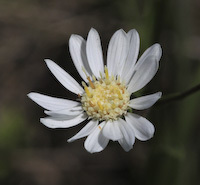 Here is a list of Aster species featured on this website. The common names listed here are the names that are used on this website for these species. If you're learning Asters, you would be well advised to also learn their Latin names as well, in order to avoid confusion. 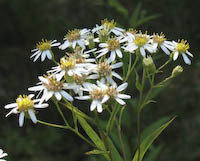 Upland White Aster (Solidago ptarmicoides) -- this is technically not an Aster - it is now classed as a Goldenrod, in spite of its common name! -- See the Goldenrod section. However, it has been included in both groups on this website for your convenience. "I am half dead with Aster. 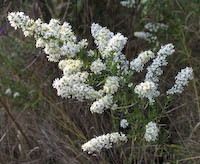 I got on very fairly until I got to the thick of the genus, around what I call the Dumosi and Salicifolia. Here I work and work, but make no headway at all. I can't tell what are species and how to define any of them ..... I was never so boggled ..... If you hear of my breaking down utterly, and being sent to an asylum, you may lay it to Aster, which is a slow and fatal poison."